A family navigates the streets of Tehran, Iran’s capital city. Photo by kamshots. Located in central Asia, with the Caspian Sea forming its northern border and the Persian Gulf to the south, Iran has been a crossroads of human civilization and transport for centuries. Soaring peaks, central basins, vast expanses of desert – not to mention susceptibility to earthquakes – have demanded ambition and ingenuity from history’s urban planners and transport authorities, who engineered such marvels as the capital city of Susa, over 6,400 years old and one of the world’s oldest urban centers; the 5th century BCE Persian Royal Road – capable of carrying a rider 1,500 miles [2,400 km] across the empire in nine days, rather than the usual 3 months required; the famed Silk Road – a trade network already over 1,200 years old by the time Marco Polo embarked upon it in the late-13th century CE. This rapid and uncontrolled urbanization of the last decades caused huge challenges for cities. Specifically environmental problems, high energy consumption and CO2 emissions, informal settlements, urban poverty, growing transport demands, and a lack of infrastructure. Moreover, the negative effects of the last decades’ car-oriented planning activities are now becoming obvious: high fatality rates, air and noise pollution, massive energy consumption, social and economic exclusion, accessibility issues, low density and segregated settlement patterns, and, quite often, deficient public transport systems. Yet, despite these challenges, the the 8.2 million inhabitants of Tehran, Iran’s capital city, have witnessed stunning growth in sustainable transport infrastructure. Over time and with great effort, Tehran has transformed itself into an example of sustainable transport. Here are three ways the city made it happen. 1. Can you spare 10 cents? A trip of any distance on the Tehran Metro will set you back only 1,000 Iranian Rials (about USD$0.10). That beats out the cheapest metro trips in Dehli, India (USD$0.15); Caracas, Venezuela ($0.24); and Mexico City ($0.23). Also, did we mention that seniors ride free? The equitability of the Tehran Metro is reflected in the nearly 2 million passengers that use it every day, and the 459 million riders yearly. A ride on the city bus, meanwhile, costs around 200 Rials (USD$0.02), although Lonely Planet cautions non-Farsi speaking travelers that, “buses never show their destinations in English and numbering is inconsistent.” Most travelers, however, are pointed in the right direction by bus drivers and station managers. Iran leads the world in having the largest fleet of natural gas-powered vehicles on its roads – currently numbering around 2.86 million. The number of natural gas fueling stations is predicted to increase to more than 3,000 in 2013. While this may seem odd for an oil-rich nation which produces over 4.23 million barrels of oil per day and sits atop the world’s 5th largest oil reserves, Iran has very few domestic refineries to turn crude oil into gasoline or diesel. Moreover, this OPEC giant also happens to contain the world’s second largest proved reserves of natural gas, after Russia. With international sanctions driving up oil prices, Tehran commuters like Sasan Ahmadi, who own natural gas vehicles, can still get to work on less than a penny (USD$0.01) per mile under current government subsidies. The city of Tehran came in as a runner-up at the 2011 Sustainable Transport Awards, organized by the Institute for Transportation & Development Policy (ITDP). 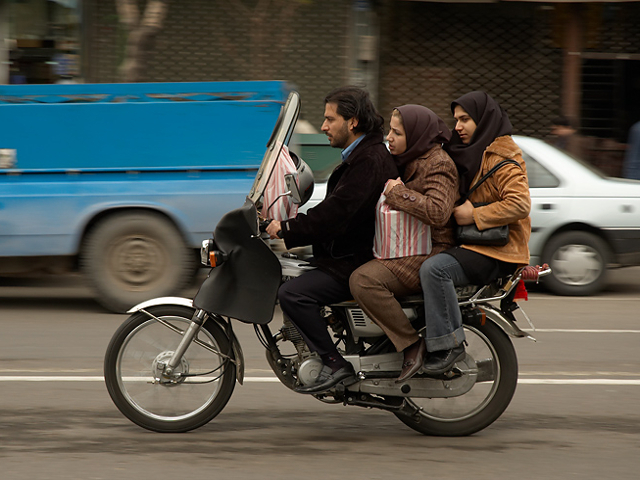 In terms of transport policy, the city of Tehran has set itself apart from its peers in the region, implementing aggressive traffic-control policies and promoting the use of public transport modes, such as bus rapid transit, metro, and the MetroBike bike-sharing system, which debuted in 2009. Since then, the city has continued to improve its transport infrastructure, expanding its bus rapid transit (BRT) system coverage and integrating fare systems between bus and rail services. Which leaves TheCityFix wondering, what else don’t we know about sustainable transport in Iran? Iranian natives and world travelers: do you know something we don’t? Leave us a comment and start the conversation!